Have you found an online vendor selling The Duppy Share Caribbean? 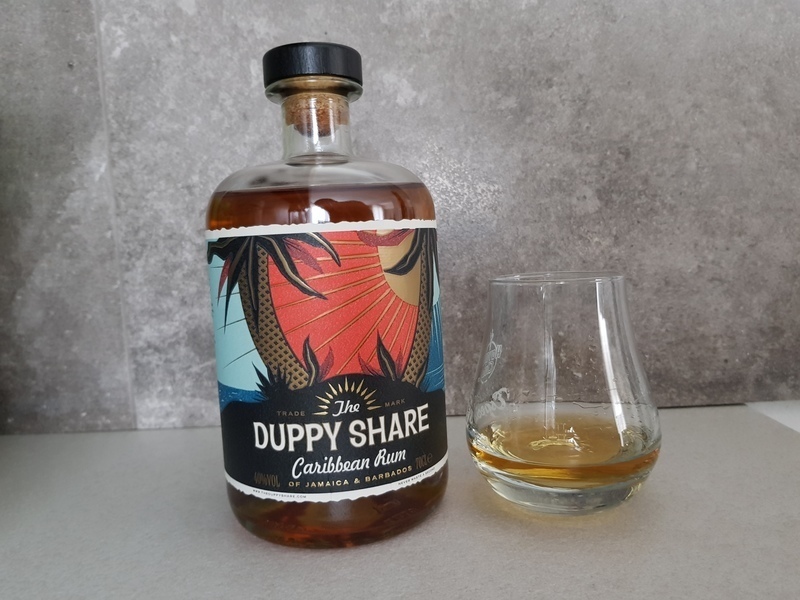 The Duppy Share Caribbean rum is produced using a combination of 3-year Jamaican and 5-year Barbados rums. Both are aged in bourbon barrels and brought to London for bottling. 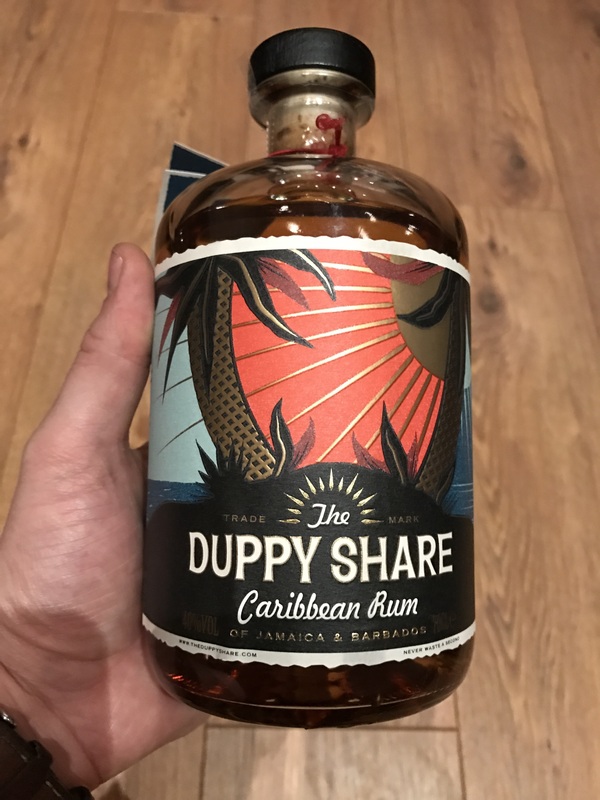 The name 'Duppy Share' comes from Caribbean folklore where the dark spirit 'duppies' take their share of rum from distilleries, similar to the traditional term 'angel’s share' when rum is lost due to evaporation during the aging process. Funny how some people mistake uncoated real rum as "artificial". No doubt the nose gives of some of the classic Jamaican funk, which is very aromatic, fruity and slightly fermented. Combined with the more subtle, but also fruity and lightly oaky barbadian profile, it all starts to get very interesting. I love the nose. It's bustling with exotic notes of pineapple, banana, mango and peaches. It's slightly sweet with an underlying woody spiciness. The taste delivers with a lightly bodied, elegant and smoothe rum that retains an interesting and very flavourful profile with subtle fruity notes, descretely woody spiciness and a little hint of the fermented Jamaican funk. The Jamaican/barbadian combination works supremly in my book. At this price it's a real steal for a very sippable rum. This is one of 24 rums "Drinks by the Dram" given to me as a present. Never heard of this, and honestly the name didn't impress me much. So, "never judge a book"...and all that. So, on to the review. Light color with a pleasant slightly spicy nose. ( I get that "funk" others have mentioned, but not unpleasant). First sip-big mouth feel, cinammon and other spices, a lot of alcohol burn and finish. I don't love this as a stand alone sipper, but suspect it would be terrific with some tonic as it has tons of body and flavor. Not overly sweet. I'd give it a 6.5 if I could, but will settle on a 7. The bottle looks fun, with an enticing story on the label but the contents disappoint. The blend just doesn't work. It smells like rum flavour liqueur and the taste is forgettable. Mix it to enjoy but neat it's nothing special unfortunately. 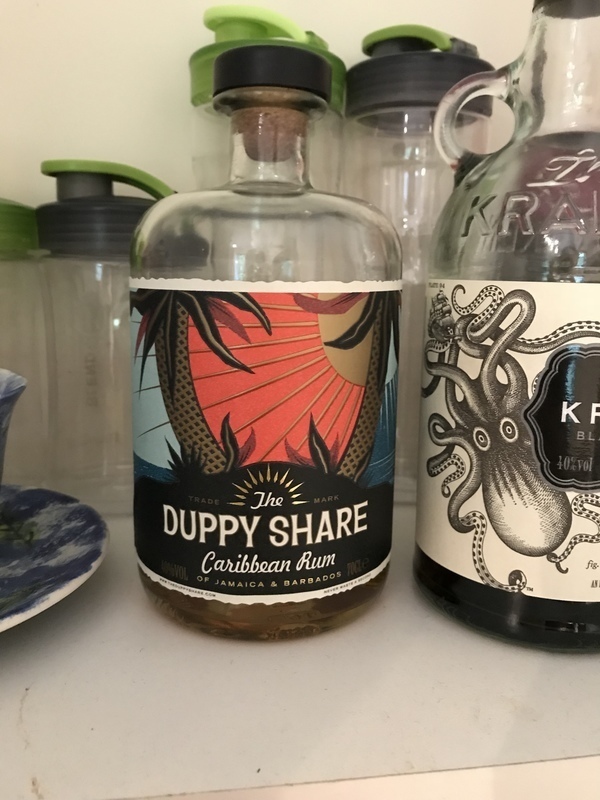 The Duppy Share Caribbean rum has a pretty decent bottle and label design, but what's inside really matters. The 3y portion of the Jamaican funk has not melted into the 5y portion of the Barbados flavors, so you get artificial vanilla and good old genuine glue for your taste buds. This was bought locally in UK and the bottle promised a lot. Unfortunately nowhere near a sipping run for me (admittedly not sure it's meant to be a sipping rum but was very expensive if it was). As 007 would say... this is "indifferently blended" !! (Ok that was a line about a brandy but you get my point!). It's not great, certainly wouldn't recommend it straight and almost always overpriced due to popularity that seems to be gained with a big marketing budget rather than being a good product. If I'm honest I was drawn to the bottle, but this has turned out to be very pleasent. Smooth enough to drink on it own but enough flavour (just) to have with a mixer (their recommendation is bitter lemon which isn't my usual choice but works well). It's not undrinkable but it just misses something if you want to make a nice cocktail it's fine, if a friend comes round and says oh runs ok but I always have it with coke then give it them, and they will be happy but I wouldn't choose to have it straight. Surprinzător de fin la prețul ăsta, ușoare arome de migdale sau marțipan, dulce..
A very attractive bottle and story on it. Nice aroma on the pull of the cork. Taste is smooth enough for a rum at this price point and can easily be sampled over ice alone. Pour in decent measures though as it takes a quite a bit of "digging" into the bottle to find the subtle flavours, but when you do it it well worth it. Nice flavour. Just what you expect it to be from a 40% rum. Smooth mostly full flavour and good aromas. One of my top 3 rums - the use of the Barbadian and Jamaican rums makes this blend particularly versatile. The fire and punch of the Jamaican rum gives it that extra kick needed for ginger-based cocktails, while the Barbadian rum rounds the taste so it doesn't overpower other aromas and tastes. This roundness also makes it very enjoyable neat, or on the rocks. Would recommend this to both those starting out their foray into rum, and those with an already developed palate. velmi zajímavý rum, který až velmi připomíná whisku. Chuť velmi vyvážená a jemná. Ale celkový dojem je lehce slabší. I really enjoyed this simply mixed with coke and while this did raise the sweetness of the drink it was very moreish. I tried some on its own and with a touch of ice melting into it, both providing a smooth and warming, if unexciting, experiences. At £22 for what, for me, is essentially a mixing rum it is a tad expensive but I will be buying it for that express purpose again. To be honest, I am in the first stages of my Rum journey, I have purchased about 7 different Rums now, and this is by far blandest I have tasted. Very mild, the flavour is a generic weak rum taste, and very little aroma. It is not a bad taste, but way overpriced for what you get. Update.. I got another bottle of this as a present recently, and it is perhaps not as bad as my initial review, but on the other hand there are Rums in the same price range that wipe the floor with it. Pretty new to all this, but so far this is one of my favourite tipples! Nice mix of spices, delicious on ice or with a mixer. Love the story behind the name. Blend is a bit more jamaica than barbados for my liking and a little bit harsh. Picked it up in Tesco for about £28. It's ok, works with either ginger beer or coke but there's plenty better out there. Po marketingovej stránke je The Duppy Share veľmi podarený produkt. Originálna fľaša s peknou etiketou, rum ktorý ma svoj príbeh. Je to zmes 3-ročného jamajského a 5-ročného rumu z Barbadosu, ktorá zrela v sude po bourbone. Po naliatí a chvíľke postátia v pohári, zacítite dubové drevo, pražené mandle, možno nejaké ovocné tóny. Chuť je podľa mňa nevyvážená, na začiatku (hneď po prvom kontakte s jazykom) je dominantná horkosť, ktorá trvá a trvá. Až po chvíľke sa dá urobiť lepšia analýza rumu, lebo tá horkosť na začiatku je skrátka priveľa. Chuťovo veľmi priemerný rum, navyše nedotiahnutý do najlepšieho konca za relatívne veľa peňazí (cca 40€). Neodporúčam piť samotný, iba ak ako súčasť miešaného drinku. Veľká škoda. I'd compare this to Doorly's XO in some ways, or maybe Doorly's 5 which I've not ad enough of as yet. They are not a million miles apart anyway. I'd say that this was sweeter than the Doorlys and that it had a more potent smell. One of those rums, perhaps, that serves very well as a benchmark to bouce other rums off of, since it's good without being any more than that. This was a pleasant surprise. Not only did I have a bottle which I enjoyed but found a duppy share tent at winter wonderland in Hyde park which had created a lovely hot rum punch. I enjoyed best with ginger beer. And it didn't carry too much of a Jamaican kick which meant it was also enjoyable for me over ice.